Happy April!! Can you believe it's already here?! I'm so excited to start the week off with a fun giveaway for you all! 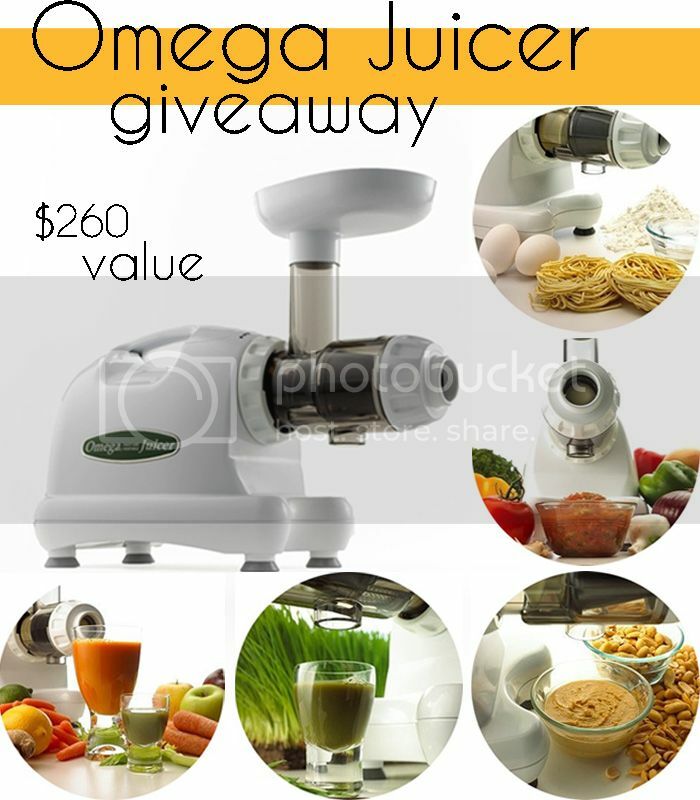 I've collaborated with a group of fabulous bloggers to bless one of you with an Omega J8004 Nutrition Center! Ok so I know this might seem like a random giveaway. A juicer?! But honestly, if you have ever juiced, or have thought about juicing...this is THE juicer to get. Brandon and I started juicing twice a day to help with our efforts to be healthier and at our best. And I gotta say, I have noticed a HUGE difference in my energy levels and how I feel overall. I never thought I would be one to say it, but. But maybe you aren't into the idea of juicing... What about making fresh salsa, homemade pasta or your own peanut butter? The possibilities are endless with this little machine. leave a comment below letting us know a meal or dish you prepared that didn't turned out as planned. If you want to stop there with your entries, no problem. You've entered just by leaving a comment with your answer. But if you want to up your chances, here are some easy ways to do just that. Just use the rafflecopter below! The last thing I made was a sweet and spicy pork loin recipe I tried. It tasted like feet...but the husband liked it?? I almost always burn rice, I think it is time for a rice cooker. Recently, in an effort to eat cleaner, I bought some kale. Stuff is nasty. SO, I decided to roast it. Long story short, my couch still smells like burnt kale. Ew. plain old boxed soup. i was sick and wanted to do something simple...thinking i could make it taste better by adding spices or whatnot in it. needless to say, that was a failed meal. husband had to save the day and go find something for us to eat. A few nights ago I attempted Fettuccine Alfredo. I over cooked the pasta, and burnt the chicken... Epic FAIL! It was pretty terrible and ended up in the trash. I tried to do a slow cooker orange chicken. Yuck! Really nasty! once my oven was broken and i didn't realize it. the lasagna was in the oven for over an hour! needless to say we had sandwiches for lunch! The last thing that I messed up was black beans. I soaked them and then slow cooked them and for some odd reason they came out HARD and bland. I have NO CLUE what I did wrong. I think it was an off day for me! BLUEBERRY MUFFINS....as simple as that may sound....I somehow managed to burn the bottoms to a crisp while the middle and tops were completely liquid!! Definitely not one of my best culinary moments!